THE SIGN STUDIOLawn Signs also known as Yard Signs are a perfect choice for businesses advertising product sale signs, campaign signs to show support for your preferred candidate, residential sales, and many other purposes. In addition to being a perfect choice, lawn signs are one of the most economical means of advertising available today. DO YOU NEED TRAFFIC & PARKING SIGNS? POLE BANNERS - EXPOSE AND ADVERTISE YOUR BUSINESS EVEN MORE! Advertising is not just limited to the regular media outlets. Many retailers, Merchant Associations and even public events use the space around their physical location to make sure people are exposed to their message. If you're location hosts a parking lot, then one way to use the space is to advertise on Lamp Posts. In an industry as crowded as fast food for example, getting your exact location to foot traffic can be a life saver. Here at The Sign Studio, we know that flags and banners in the right spot can be a make-or-break advantage for your business. 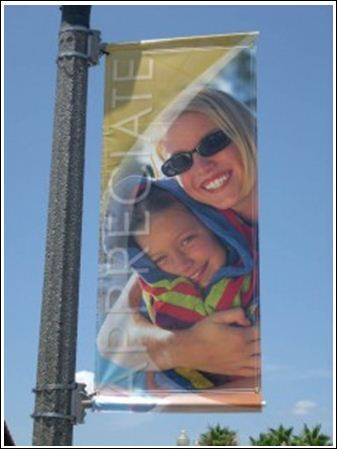 Our outdoor Pole Banners and street signs can be printed from files created in any of the common graphic design programs, or we'll do the graphic design for you. We print on either matte or glossy finish vinyl that gives beautiful colors. If you need to buy the mounting hardware or need us to install, we can help with that too. Several major chains have already used our services and continue to capture the imagination and attention of customers all across America. The Sign Studio already has a large selection of creative street signs and custom banners, but if your business needs some special configuration, we are more than happy to custom make that banner for you. Creativity is one of the most important factors in attracting consumers. Using the shape and even the light of your physical surroundings can express to your clients how creative your business is. It can even be a simple message, like designing the banner as one of your products. Our Team at The Sign Studio is always ready to help!